This blog (stuff you look) is basically started for CEED, later UCEED topics were added. Now that I went through NID Design Aptitude Test (DAT) syllabus and analyzed the pattern, fortunately; I found that most of the CEED/UCEED topics are similar to that of NID DAT pattern. So, in this page, I have gathered all those useful topics which are relevant to NID. Also, I have included all those mock tests, which are directly helpful to your preparation. Although a bit late, but hopefully you will find these page useful. Please note that since the entire syllabus is not known, this collection is based on my pure observation/analysis and need not necessarily be 100% or might cover topics that may/may not appear directly in your exam. I hope you will appreciate this. NID MDes CDAT new pattern - what is it and how to deal with it? Is Coaching required for NID-DAT exam preparation? Although the below included mock test are designed for CEED and UCEED, it's obvious that these can be of great help for Design Aptitude Tests too! So, hoping that you have sufficient time, you might have a look at below sample tests/questions to understand the kind of questions/syllabus and how to solve them. sir please can you provide study material for numerical type question (uceed) ? Will consider them in upcoming updates. any updates for 2017 nid/ceed exam? Thanks for the study material. Any idea kind of cut off marks NID follow? I think you haven't checked this page properly! can u plz give the soln to official sample paper from nid website for 2016??? Dude u r just great...hats off for these topics, really helpful. Hi, can anyone tell me whether one needs to colour the sketches. in the admit card they have clearly mentioned to carry colour pencils, etc. That would be of great help. Although it's not ,must, but if you find time, then you may use colors. Colors during NID exams have good preference I guess. Tomorrow is the exam day. This was really helpful. Thank you so much. I think I'm prepared for the exam now. Only one thing I wanted to ask you. Do I need to carry water colours too? I have my admit card, ID proof, pencil, ruler, sharpener, eraser. And yes, pencil colours or oil pastel? What else is required? coloring media depends on your preference (as per your hold on them). Both are good to carry - if you can use them easily. I'm nervous right now. Tomorrow is finally THE DAY. You were of great help. Thank you so much. It would be great if all this paid off well. I have my admit card, ID proof, pencils, sharpener, eraser, ruler. And, oil pastel or colour pencils? Also, What else should I carry? Thank you. :) It went well, according to me. Just waiting for the answer key. That's great, I also heard that paper was easy. I'm having plans for NIFT, will consider after UCEED exam. If any other sources found, I will share. Can anybody tell me if there is negative marking in NIFT or no? Sir, can you just help with the CAT thing? I can pretty much prepare for GAT. But, seems like both CAT and GAT matter individually. Hi Sir , I am a regular viewer of this blog . I am preparing for UCEED from here and have prepared for NID also from here ! Sir yesterday I wrote my NID exam well but in subjective,due to lack of time I left one complete 10 marks question ... , rest all I could do well ... but now I'm very much tensed wether I would be qualified for the next round or not !!! Even many wrote the exam with sincere coaching but I don't even have that !!! Finally,Sir , will I be able to qualify for the studio test or not ? Thta's ok if you have attempte the remaining ques properly. The asnwer to Whether u qualify or not? depends completely on competition and your attempt level of rest ques. We cannot judge just like that. Thank you sir , what you said is right, drawing alone is not sufficient but we need to do it in time ! no problem, it feels grt to help others. was it usefull comment down below the answer key..
im looking for answers for nid papers,where could i get them? In my result, it was mentioned as "according to your DAT score NID vijayawada will contact you separately" what does that mean? Probably they meant that your score is not suitable enough for the three major NIDs but is possibly suited for NID Vij. You might get the confirmation once NID Vijayawada shortlist candidates. Sir I have qualified for bdes 2nd and 3rd level for nid. Thanks a lot for your valuable guidance and resource material. Sir pls tell me how to prep for next levels. Any idea, what was the cut off score for general candidates? Thankyou very much sir for your support. I'm not sure about DA-IICT, Haven't heard any reviews about that. Waiting for one more year really depends on certain scenario - like if u r working, then u can think of it, or if it's ur final year, then it's really worrying to wait one more year. But, if u r confident that next time qwhen u apply for competitive exams, if u can clear to some extent, then u can wait instead of compromising for private institute. If u r doubtful about nxt years competition, then do check for better options right now. Only this much I can say Saurabh. Decision is urs. 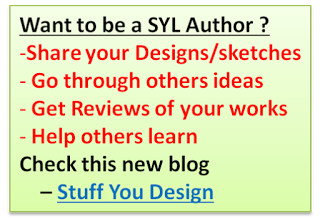 second Can i link some of you blog content to my blog ?? Nice to go thru ur blog designed graphically with infographs. Good work and glad to see you help others. I will definitely leave your blogs link in my blogs resource page once your blog has sufficient and useful content. Your blog still needs content to be shared. So, be on it, once you have sufficient content, let me know. You cannot copy my blogs content as it is, since content is copyrighted. Google disagrees this. Digital Game design in NID is not new, but yes, as far as I heard campus placements are few and I'm not sure about their course module. If you have plans for startup/company in game designing, then you need not have to worry, but just for taking some course, don't do that. This is what I know. Sir please guide me as how to start my NID preparation. NID has design and sketching part too, so better start with basic sketching. Make yourself comfortable with object sketching minding proportions, perspective, scaling etc. Simultaneously prepare for the three other sections covering aptitude, topics of which are available in the resource and this page. Sir, could you tell how much should i focus in just drawing for NID. And which part need more focus compared to Drawing and Quantitive /creative ability. Unlike CEED, drawing part in NID plays a crucial role. But it should not be forgotten that aptitude is also a part of your exam and adds weight age to your screening (as well as for final selection). One might not get selected if he does performs 100% well in drawing but not able to clear aptitude part. So, literally we cannot neglect both of them. If ur already a good sketcher, then focus on aptitude too! otherwise concentrate more on drawing initially until the last month of exam. Thank you very much..for your assistance. Sir for second round test in NID , is coaching required or it can be done by self. Actually,yes, it's better to have a coaching assistance for later part (esp. portfolio making). It's best if u are not having much idea about how to organize or make content for your folio. Does NID has changed pattern for 2017 exam? Probably similar to 2016 pattern, check the syllabus in this years brochure. "The process of admission to NID for B.Des. and M.Des. programmes consists of three stages. Sir I am really confused among the GDPD and B.DES courses offered by NID. Could you plz tell me about their difference and most importantly which will be better for pursuing design career. Can M.des be done after GDPD course.? I can confirm that only when the official NID brochure is out, which is not yet open. It will be open by first week of Oct (as per the website). As far as I believe, the pattern SHOULD BE SAME to the previous year since last year only they adopted this pattern, and I hope they will not change it that soon (within a span of year). Anyway, Pl. remind me when the application webpage is active with official brochure. I will go thru that and confirm then. Thanks. Sir the material which you have provided here for Nid dat preparation for 2016 is it the same for 2017 also ??? ya, I already updated this in SYL FB timeline. I do remember that I said once to chk the pattern as well as update timetable (if possible) as asked by some people in FB. Will update them soon once I get time. It's not last minute, you still have two months! while the new pattern has several topics to be covered. I'm already trying to make posts for NID soon. I am applying for Mdes. Is it possible to find the previous year question papers at one place ?I assume that the DAT exam for Bdes and Mdes is the same. Isn't it ? previous years papers are not available anywhere except the sample test that is available in NID brochure as per my knowledge. Ya, DAT (prelims) syllabus for bdes and mdes are same. I'm preparing for NID and CEED this year and was wondering if its worth investing in the "Study Material" offered by institutes such as Mosiac or Silica. If this query has been answered previously I apologise for asking again. If it were CEED/UCEED, I wouldn't have recommended. But since for NID, no previous papers are available and it involves more on design/sketching, so material selection depends on your level. If you are good enough to do self study or preparation and could deal with design questions by yourself, then It's ok to go on self pace. I'm not sure whether those materials covers all aspects of NID including design, and I still wonder whether design can be studied on books rather than practice/instruction from someone. I would suggest you to get reviews from someone whom have already taken (or taking) the course now. That should give u an idea. I think the major attraction with these study materials is that they provide previous year papers(solved). And NID's previous year papers are not readily available. I have recently filled in NID application form for 2 fields and submitted the form along with the fee.I have by mistake filled in 'DOB' in 'place of birth' field. What shall I do,would you please recommend. Since changes cant be made once the payment is done. I have written a mail to NID as well, haven't received a reply yet. I am very worried if the application will get rejected, please suggest. There shouldn't be any prob I think, u hve alrdy informed them in written which will have added adv interms of proof. Anyway, try calling to their landline no. provided in admission page or brochure, If they r not replying, then u may call to NID office no. available in NID website n ask them to direct ur call to the concerned. That shld work. Thanks for the reassurance :) I called the admission cell...they said that they cannot guarantee that the form will be accepted. What should I do now? They must hve told that just to scare u, in order to not repeat similar kind of errors nxt time, imagine if they readily agree, then students might not bother checking the submission docs properly before they submit. Had the case of their reply being 'it's not possible', then we would have to bother, but since they said the other way, I believe it's ok.
Or to be on safer side, if there is any cancellation option with refund, do that and submit a fresh appli. I think this shld be kept as ur last option. that's already in my next NID resource update list, will update when i get time. I cannot guarantee about sample paper but will try my best to get time. Sir, Does DAT exam differs for U.G and P.G ??? syllabus fro prelims will be mostly same but content for mains differs a bit for UG and PG. You can check NID brochure for more detailed clarifications. Sir, I want NID Mock paper 2016, but I couldn't find it. Please send me. it's in this page only, I don't know how u r not able to see it! Sir I have practice d those mock tests and also the things u provided for nid n uceed. Now dis is d last month so can u please tell what is left or what should I practice. I m worried abt nid. Wat to do?? practicing only mock test is never sufficient for NID/UCEED preparation. They r just a way of understanding the pattern n they cannot cover all. Syllabus is known n u have already did some study, so sort out the list n check if u have missed preparing any topic or if u needed more practice/revision on specific topics. Also, GK prep shouldn't be stopped till the last end esp for NID, as you know most NID ques r GA/GK ques. The materials that I shared with u all is not complete, i'm still trying to gather more, will share soon, till then try preparing based on topcis list. Can we include ideation sketches in NID exam if product qst. will come...like we do for ceed? In NID, what I observed is they provide space only for the final sketch. So, I guess showing ideation process is not mandatory unless they specifically mention. But, u can! it adds to ur design! Thank u so much Gayathri for sharing the update with everyone. Tomorrow is D-day.....wanted to thank you for the last time,for this amazing blog!!!!! I recently get NID-DAT and I found that question no.30 answer was 11 and the answer is not given in the options.when I see answer keys the answer was 10 that was wrong. for objection why should I pay for their mistake. But one reason could be, if they said it free, then every participant will give his/her own answer as he/she did in the exam thinking that it is wrong! then it would be mess u know! Yaa got it. . .
You are running best blog for design exam preparation. . .
. .KEEP IT UP. . . I agree with Nirav. Why should someone pay for NID's mistake? They should re-imburse the money for if its NID's mistake. I am not sure if they do that. Also, Bhanu Sir, thank you very much for being responsive. Your efforts in keeping this blog updated are commendable. Nirav patel, are you talking about the question asking to count the number of surfaces? The answer is 11, but the options had 10,12 and some other set of numbers..
Hie. I just wanted to know what will be the estimated cut off according to you in NID 2017? And do they select on the basis of separate cut offs. Like if a person gets through the gk cut off and has less marks in the drawing section as per their cut off , but the total marks which he gets is more than the passing marks , so will he be eligible for the second round? I have the same doubt. Please someone clarify. Hello. I got shortlisted for lifestyle accessory design. Anyone else who got shortlisted for the same? hey archana.. I got shortlisted for the same and Universal design too. Dont know what to do in portfolio.? I'm stuck on the folio too. Bhanu Sir,Could you help us with some suggestions here? sir. pls.. help me to qualify studio test and interview.... pls send me some link regarding to it. just anything would be very helpful to me sir. Thanks for creating a wonderful place for bring all the design related resources into a single page. I have cleared my prelims for Strategic Design management and Information design. What is the expectation from my portfolio in the Strategic Design management discipline? What can I expect from the studio test for SDM and information design as well. Could you please give us some insights over these things mentioned? Thanks a lot in advance for your time! As you might be knowing, this year,NID is not going to conduct it's interview session for the undergraduates, so all that matters now is the studio test, so , sir , can you suggest some extra tips to keep in mind while appearing for the test? And, thank you for creating such a wonderful blog, it really helped many students like me a lot. Ya, I too heard that they are not conducting interview this time. But I seriously wish that they will conduct interview instead of studio test. Anyway, for studio test, since it's pattern is not known tous, we can assume that the test will mostly be stream specific and includes written, oral explanation, hands-on works like they will give some raw materials like ice cream sticks, small cardboard boxes, glues etc and would ask you all to make some creative stuff, either in teams or individually. Apart from that, the written exam might include, situation analysis, story writing, sketching and MCQ just like NID exam. Good luck brother. I do not have any in my network who might explain the rank trends of M.Des in NID-Universal Design, so looking up to you! i'm really not sure abt their shortlisting criteria. They never real coz they follow mixed trend which might be based on their personal view too. So, I think only hope is being positive. Gud luck bro. I too have a similar rank in Open category. Did it change for you, the consent thing? I can't see any option to give consent, Do we have to send a mail for that consent? Hope to find a solution or clarity on the same. Just wanted to Thank you for this wonderful blog. It was the material here which gave me an insight for preparation for CEED and NID DAT. 3. also carry some A4 sheet drawing papers just to be in safer side. Can You Pls Send Me Your Resume I Have Just Completed 10th What All Should I Have?? what u r going to do with someone's resume after 10th ? where can I find NID mDES previous years question paper? when are you going to update the site for the upcoming exams in 2k18?? I need to update only when syllabus changes from previous years. If the syllabus for this time is same, then no need to update, anyway this page and other pages are getting updated every now n then. Any leads on where to get the previous years question papers for NID-DAT PG? Most of the papers available out there are for GDPD. Only the online coachings etc seem to be selling the actual question papers of previous years. Hi Bhanu, Would you send me the NID question papers of 2015 and 2016 along with answers? Cause I couldn't find them. Please..
Do you have previous year papers for MITID DAT and SEAT ? Can you please provide details about the same if possible. Any updates for NID DAT2018? Scissors ans glue sticks are needed ???? i don't think so. Hands on work is not there, so not needed. For mains, u may need them. Hi Bhanu . Can you please help me for the today's Nid exam . My daughter missed to write the question paper series no. In the answer sheet . However she has entered her name and roll no. In question paper . The invigilator also signed and stamped the answer sheet without checking whether all the details has been filled or not . Do you have any idea whether the OMR sheets are checked before feeding in the computer . Please advise . This usually happens and many students does this mistake. The invigilator has little or no role to be blamed for he/she would be in a hurry to check everyone's paper in the hall. The first responsibility should be on the student for he/she should've been careful about his/her own paper. If the student is not checking their paper properly, how can we expect a third person to do the job? Anyway, according to last year students, normally the paper will be evaluated in such situations with a written concern. I mean, the student usually write (mail) to them stating their details (including the roll/admit card no.) and request for considering the evaluation. That is how it works. Please mail to the official nid id available in their webpage. Hey people, How did your NID (UG) 2018 Exam go? it was okay... i did find the drawing questions a bit difficult according to the time given to us. Anyway, how did yours go ? Time wasn't sufficient...I had a lot of ideas :( Couldn't draw them well. I am keshav studying in 11th std.. I live in a hostel where I cannot access my gadgets and therefore don't get guidance of how to prepare for for nid.. I do things like making things out of waste .. comic strips.. magazine . and stop portfolio prep ...?? thankyou soo much for this blog and hands off to you ..
Hey people! How much are you scoring in Part A of NID DAT (UG) 2018 after checking from the official key? I'm getting 52 but i do have concerns about some questions...going to challenge them. What are the questions you are thinking of challenging? pictures and their meaning,(shoes and fork). Oh! even I was thinking about those questions. What do you think are the answers for that fork which is bended back and the for which is bended together? Hi. In the NID-DAT UG paper 2018 there was a question asking the number of triangles in a star. The official answer key shows the answer as 8 but the correct answer would be 10. In your opinion should I challenge the answer key? yeah, the correct answer is 10. many people are going to challenge this question. Q 63(In BookletD).Which of the following shapes can fill the given figure without any gaps? I really like these materials. But i have one question is that, if i prepare for CEED, will it be helpful in cracking NID DAT, or i should prepare for both exams separately. I have have heard that if someone prepares for ceed, it will be quite easy to crack NID. Please suggest something, i'll appear next year. Yes CEED preparation helps for NID too because many of the stallbus overlaps. But, that doesn’t mean preparing only for ceed will help you for nid in full fledged. CEED part A is slightly aptitude oriented while NID objectivity he’s are mostly GK/GA oriented. Also, there’s a variation in the subjective of the two also. So, it’s advised to plan for both the preparation separately. Sir how to contact you? Can you tell some ideas on this: Draw with use when enlarged 10 times than the original size. 1) Pressure cooker 2) marker pen cap 3) cytter 4) zip 5) Computer mouse 6) battery cell. for comparison, I would suggest you show something next to this product - like a stove adjacent to the cooker such that cooker is bigger than the usual size with reference to the stove. In other words, the stove will look pretty small (around 10 times smaller) in comparison to the cooker. firstly really grateful for your guidance for aspirants like us,thank you sir.i will be giving the nid exam this coming year(2019),i am still beginner in shading and coloring,even though i am good in sketching but now i am confused on what topics to be doing practice daily to hone my skills.and about the portfolio what sketchbook do you recommend to make one>>? ?really good blogspot for us nid aspirants thanks for your hardwork once again. You can ch CO the following page for everyday subjective practice. Hi, I had prepare for NID last year from your website, and i must say thanks for giving us online study material, it really helps me a lot. I just wants to know that is there any new study materials required for NID 2019 pattern? For MDes - yes, That's because NID has changed their pattern from this year. You can find the updates in this page itself. Sir can you please give link for product designers of India if possible. Also in ceed product design questions to what extent are we expected to give manufacturing process details? product designers is prety huge and it's impractical to list them all. You can however google and find some pages. Manufacturing process details depend on the product you are doing. For most cases, detailed manufacturing process is not required unless your design carries the form, which seems to be difficult to male using the regular process. IN most case, better to specify the material and if u can, then just list the process, else process listing is not req. Can you please check the question number 18(set A) of nid dat bdes of 2019. The results are out and the challenge time has begun. I have a doubt with that question. I am willing to challenge them but I would like to know your answer sir!! Please help me with that!! For the MITID DAT test which type of exam papers on here would you recommend studying? thanks a lot for making this site!